Fallon Park, just northeast of Five Points, and sloping with its long narrow shape down to Crabtree Creek at Anderson Drive, is a long necklace in Raleigh’s park jewels. The remains of a small mill structure lend even more interest to a wonderful rockfall along the creek that defines the park. Fallon Creek is short : its headwaters gather right in the front yards of the very well appointed houses along White Oak Road off Anderson Drive. The long skinny park has an unpaved path that is heavily used by joggers, walkers and doggers. I never go on the weekend, but I have such fond memories of going there on weekday afternoons with my small children, chasing crawfish in the rockpools and climbing around the old mill structure. It is a clean, rock-filled creek with a wide range of trees and plants arranged around its slopes. There are small grass meadows at the top and bottom. It serves a surrounding community that maintains rich, semi-organic plantings in its large yards, and it drains steep wooded slopes with older houses and little construction. The creek’s quality reflects all of that. Rockpools where Lily and Dori and I fished many times. Rockfall and brick mill structure. 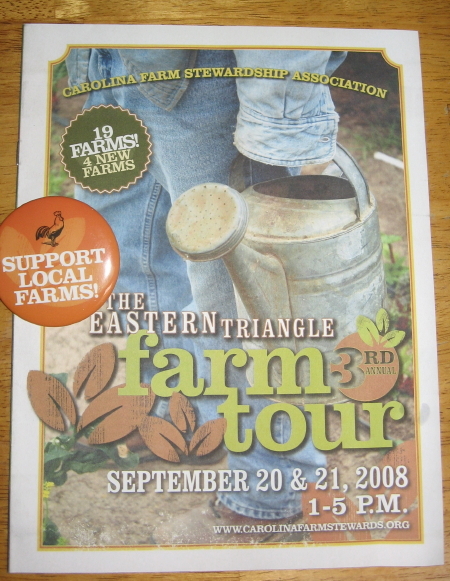 I posted at Raleigh Rambles about the Carolina Farm Stewardship’s farm tour. It was a fun couple of drives, and we saw plenty of nature to go along with the agriculture, as pictured below. Above, a native plant area at the Piedmont Biofuel Lab Farm. Below a large bird, perhaps a raven , that swooped down toward the highway for some time in front of us. I suppose it’s probably a vulture, but it certainly didn’t act like one.